Do Kids and Babies Need Sunglasses? The short answer is yes. Because the cornea, lens, and fluids in children’s eyes are much clearer than in adult eyes, shortwave light (such as harmful ultraviolet rays) can more easily reach and damage the retina. Add to this the fact that the younger we are the more likely we are to spend more time outside (experts estimate that between 60-80% of sun exposure in a person’s life happens before the age of 18), and the answer becomes an even more resounding yes. But this is often easier said than done. Many babies will attempt to take off sunglasses as soon as you put them on. If they do, there is no need for you to fret over it. You can put a wide-brimmed hat on your baby. But before you do that, be sure to check out special baby sunglasses. These sunglasses have a stretchy band that goes around your baby’s head; making it harder for your baby to pull off these sunglasses. 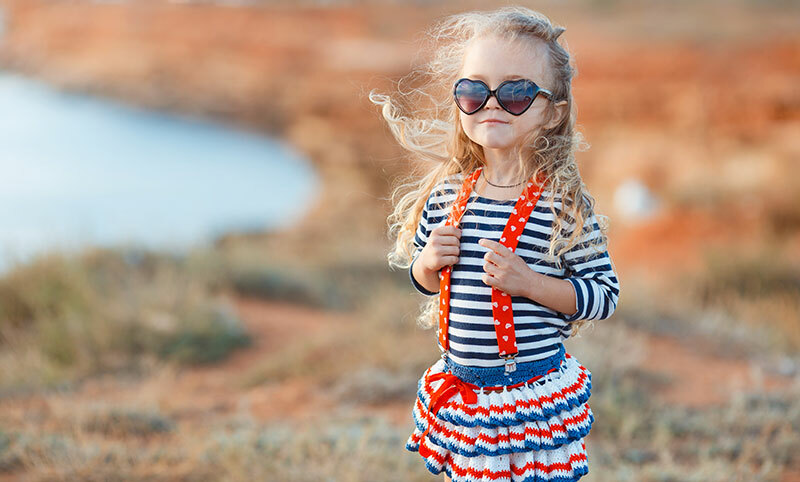 When it comes to sunglasses (for kids, as well as adults), the quality of the lens really matters. Make sure glasses meet ANSI (American National Standards Institute) requirements, and that the labels clearly states that they block UV absorption up to 400 nm (nanometers), or 99 to 100 percent of both UVA and UVB rays. Keep in mind that it does not matter how light or dark the sunglasses are. The lenses have a chemical in it that block out the ultraviolet rays. Finally, make sure you buy sunglasses from a reputable source. Any pair that is labeled appropriately in an established store or online should be fine, but stay away from street vendors when it comes to sunglasses.